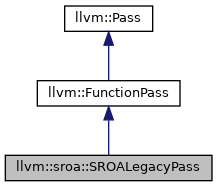 A legacy pass for the legacy pass manager that wraps the SROA pass. 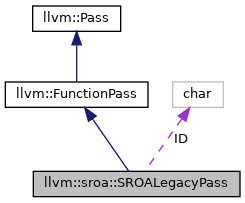 This is in the llvm namespace purely to allow it to be a friend of the SROA pass. Definition at line 4563 of file SROA.cpp. Definition at line 4570 of file SROA.cpp. Definition at line 4584 of file SROA.cpp. References llvm::AnalysisUsage::addPreserved(), llvm::AnalysisUsage::addRequired(), and llvm::AnalysisUsage::setPreservesCFG(). Definition at line 4591 of file SROA.cpp. Definition at line 4574 of file SROA.cpp. Definition at line 4568 of file SROA.cpp.